Ceramic flower or plant pot with a picture of Mrs. Schultz. Give her a very own look based on your personal plant choice. A playful piece of design and kitsch by Swedish designer Ingela P. Arrhenius. 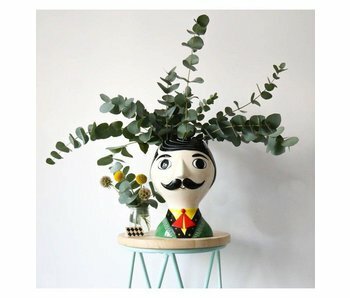 Ceramic flower or plant pot with a picture of Mrs.Bauer. Give her a very own look based on your personal plant choice. A playful piece of design and kitsch by Swedish designer Ingela P. Arrhenius. Ceramic candlestick in the shape of Carlos, a Mexican man. It is in its head that the candle fits! 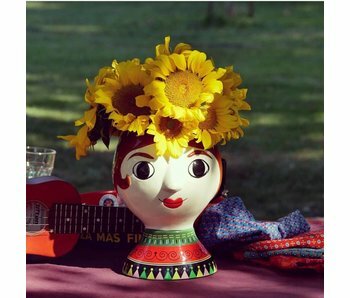 Ceramic candlestick in the shape of a Mexican woman with a melon on her head. It is in that melon that the candle fits! The mix of vintage inspired design with the Mexican artisan style of Kitsch Kitchen makes this an awesome object. Time for coffee or tea? Enjoy that moment even more with the retro mugs from Kitsch Kitchen. They have a large white handle and a picture of a lady or gentleman. Here Mr. Krauss, a real gentleman with moustache and bow tie. Time for coffee or tea? 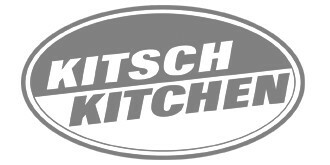 Enjoy that moment even more with the retro mugs from Kitsch Kitchen. They have a large white handle and a picture of a lady or gentleman. Here Mr. Wolff, neatly in a tailor-made suit.